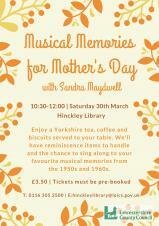 Hinckley library on Lancaster Road will be holding an event called "Musical Memories for Mothers' Day' on Saturday 30th March 2019 from 10.30am to 12.00pm. 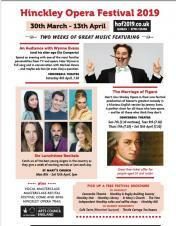 Hinckley Opera Festival takes place between 30th March and 13th April, a fortnight of musical events supported by the Arts Council (please see attached pdf for more information). It will include performances of The Marriage of Figaro at the Concordia Theatre, for which, thanks to Arts Council England funding, 50 free tickets are being offered for each show to people aged 30 and under. Leicestershire County Council Highways department has agreed to a Temporary Traffic Regulation Order on Tilton Road. The road will be closed between the Pentecostal Church Centre and number 13 Tilton Road on 25th March for one day. Long-serving Burbage Community Arts Festival (BCAF) volunteer Laurence Wilkins has been honoured with the Parish Council Chairman's Community Award for 2019. Mr Wilkins has been a leading member of the BCAF team for the past two decades, serving as chairman for more than 10 years, a role from which he has only recently stepped down. 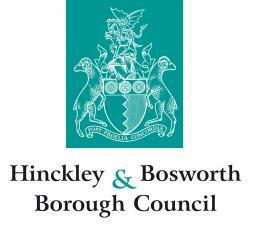 Hinckley and Bosworth Borough Council is promoting a scheme which helps to make sure that essential medical information and next of kin contact details can be found easily in case of an emergency in someone's home. A Temporary Traffic Regulation Order (TTRO) is to be made for a section of Rugby Road, Burbage (see attached plan) to allow Severn Trent Water to make a new water connection. The TTRO will incorporate a temporary road closure which is expected to start on 13th April 2019 and to last for not longer than three days. 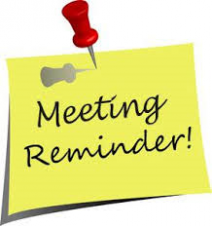 Annual Parish Meeting - 4th March 2019, 7.00pm at Burbage Millennium Hall. Please come along to find out more about the work of the Parish Council. A full meeting of the Parish Council will follow this meeting at 7.30pm - all residents welcome to attend. The Borough Council's Annual Making a Difference Awards, recognise the contribution that volunteers make in strengthening our community, and improving the quality of life for residents. The awards recognise both individual and group volunteering contributions. Residents are invited to nominate a person or group that deserves recognition for the help they give to others. Cuddly crime-fighter Burbage Community Bear will be special guest at a free crime prevention event to be held in Burbage Millennium Hall on Saturday 2nd March between 3pm and 7pm. The drop-in event, in the main hall, is being co-ordinated by Burbage PCSO 6035 Darren Stretton, who is based at the police office in the community building on Britannia Road. A PRANCING horse, which was put out to pasture while work was carried out at its home in The Horsepool, is now back in the green space where it belongs. The hand-carved relief of a rearing steed was previously stabled in a planter on the site, where, at times, surrounding growth left only its head visible.